McLaren-Honda came into this race weekend with hopes of a result more grandiose than their engine has allowed them so far this season. The Hungaroring's reduced emphasis on engine power made the McLaren-Honda MCL32 a more competitive car this weekend than at any other race in 2017, allowing Fernando Alonso and Stoffel Vandoorne to net P7 and P8 in qualifying. Though Vandoorne slipped back through the field as Sunday's race progressed, eventually finishing tenth, Alonso capitalized on the contact between Verstappen and Ricciardo, which burst the Aussie's radiator and sent him into an early summer vacation, by snagging a P6 finish, a monumental result for a team that was dead last in the Constructors' Championship before this weekend. 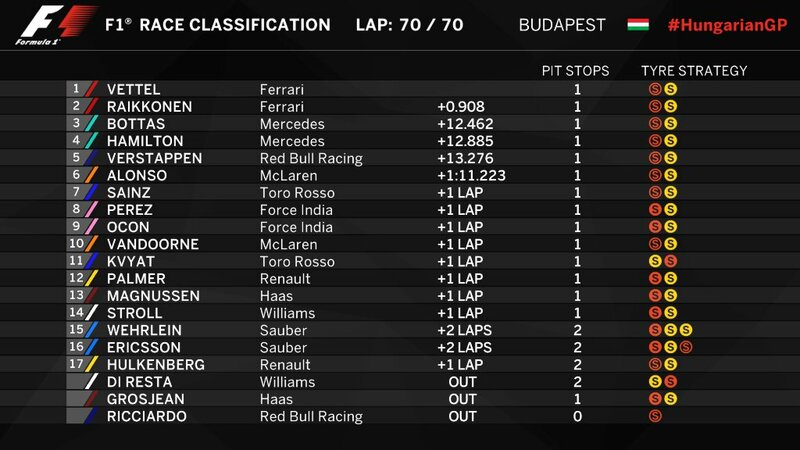 Toward the tail end of the race, with clear track ahead of him, and no fuel to weigh him down, Fernando Alonso set the fastest lap of the race, a 1:20.182. This lends further credence to McLaren's belief that their MCL32 is among the best chassis of the current year, though the subpar Honda engine has hidden the car's true potential throughout the ten races preceding Hungary. This mirrors a similar performance by Sergio Perez earlier this year, when he set the fastest lap at the Monaco Grand Prix, which also rewrote the overall lap record, now standing at 1:14.820. He was able to set this time when he found himself in clear air with no worries of wearing his tires out, and with the interest in squeaking out the best lap possible. Alonso was not able to raise the bar of the lap record at the Hungaroring, which stands at 1:19.071, set by Michael Schumacher in 2004. Alonso, though he considers himself a stronger driver than ever before, was nevertheless not expecting to set the fastest lap of the race. "Sixth was the best result possible. Fastest lap is a gift and we will take it,” he told Sunday Express. Whether or not this has influenced Alonso's impending decision to stay or leave McLaren-Honda is not yet known, but it does bode well for McLaren-Honda if he sticks to his ultimatum. Update: DHL has published the onboard footage of Alonso's lap. Oliver Rowland makes up a little more ground in the championship as Leclerc has gearbox issues. The three-time champ doesn't think his team will be able to compete with the prancing horse.